Updated and revised! This 80+ page guide is a compilation of the most common technical questions encountered in Wall Street interviews. This guide was created to provide prospective financiers a thorough review for a fraction of the price of other interview guides. This is an electronic pdf so you get everything immediately and can start studying right away. 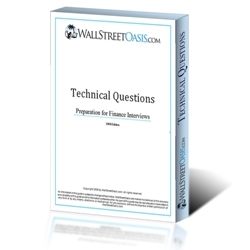 Technical questions are part of almost every finance interview. While the level of difficulty of these questions vary from firm to firm, you will undoubtedly be quizzed on technical questions in at least one round. Detailed and accurate responses will more likely impress your interviewer and help you land the job. In this difficult market and competitive industry it is important to gain any edge you can. If you put in the time to review, this guide will give you that edge. Good luck and please let us know if you have any suggestions for improving the Technical Guide by sending an e-mail to wallstreetoasis@wallstreetoasis.com. "I bought the Vault guide and there is a lot of fluff, this guide is straight to the point. Question, explanation, sample response. It was amazing. Going into my interviews and superdays, I almost never got a single question that I hadn't seen before, or wasn't able to work my way through." - Scott M.